It’s Speedy Tuesday! 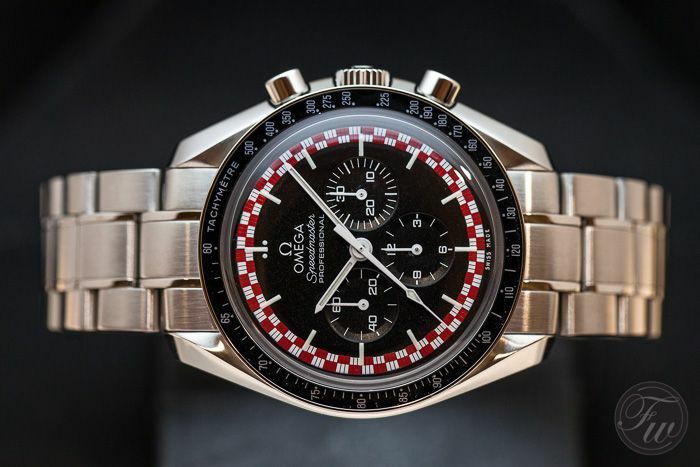 We thought it would be nice to give you a summary of the best read Speedmaster articles on Fratellowatches. For a full overview of the almost 100 Speedy Tuesday articles we did, please go to the Speedy Tuesday section. It has become very clear that our readers love the new Speedmaster Dark Side of the Moon. Cut out of a block of ceramic, the use of the in-house developed and manufactured Co-Axial caliber 9300 column-wheel chronograph movement, the ceramic dial and the soft strap is popular by almost all Speedmaster fans out there. The delivery to the boutiques of the Dark Side of the Moon is slowly happening but most pieces are already gone as soon as they arrive as there are waiting lists for them. The pricing of the Dark Side of the Moon (and all other caliber 9300 Speedmasters) seems to be frowned upon by many, but keep in mind that the original hand-wound Speedmaster Professional is one of the cheaper watches from the current Omega collection. The innovative movement, ceramic case and finish of the new line-up of Omegas justifies the pricing in our opinion, especially when compared to chronograph watches from certain other brands who deliver less value. Click here for the article on this Baselworld 2013 novelty. Also introduced in Baselworld 2013 was this Speedmaster ’57 Co-Axial caliber 9300 timepiece. Whether it was influenced by the original Speedmaster CK2915 or just refers to the very first production year of the Speedmaster can be found here, but in any case it is a stunner and our readers agreed on this as well in 2013. This Speedmaster ’57 Caliber 9300 measures a modest 41mm in diameter and has a symmetrical case (no crown guards). A very elegant watch! In the meanwhile, there are a number of versions of this model available at your Omega retailer. We prefer the all stainless steel version, but also happen to like the gold/steel edition on a leather strap (we are currently preparing our hands-on review with that one). 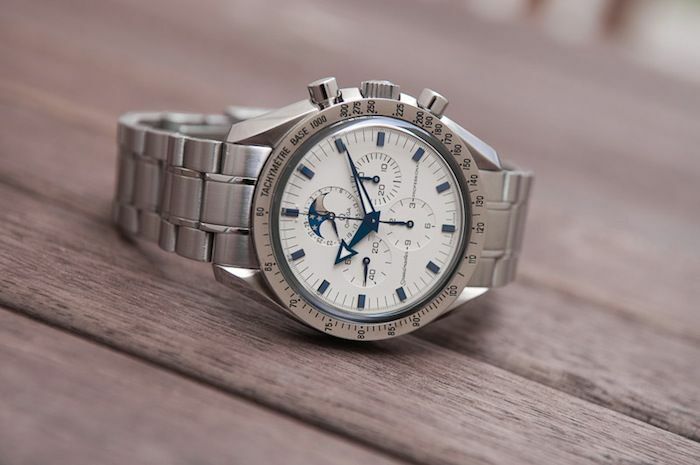 Click here for the article on this Omega Speedmaster ’57. 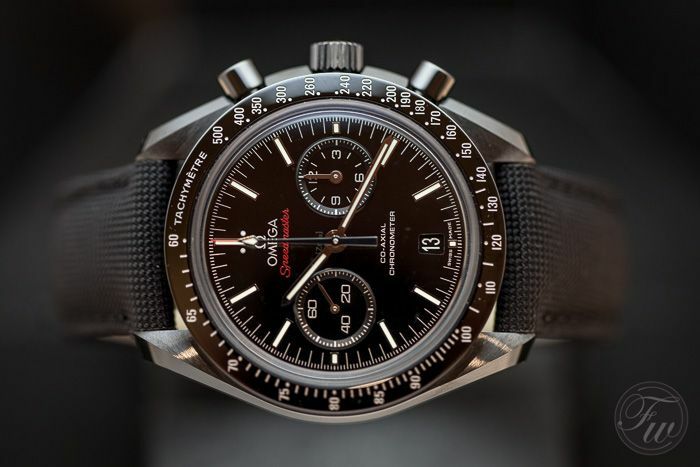 We did a review on the Omega Speedmaster Co-Axial Caliber 9300 ourselves in 2012, but we had a guest contribution by Lukasz from Chronos24.pl early 2013 talking about this piece as well. He gave his view on this first Speedmaster with the in-house developed co-axial column wheel chronograph movement by Omega. An interesting read for anyone interested in buying this watch. With the new Speedmaster Dark Side of the Moon and Speedmaster ’57 models the decision making can be a bit harder, but it is still one of the modern Speedies we would like to own ourselves as well (besides the Speedmaster Professional). This article almost got us sued by the rightful owner of Hergé & Tintin publications. We were the first to report about the true story on this specific Speedmaster Professional. Introduced as a Speedmaster Professional Racing edition, we soon found out that it was actually meant to be a special edition to honor the Tintin (e.g. Destination Moon) comic. The small seconds hand at 9 o’clock was actually the Rocket as seen in Tintin’s Destination Moon book, but after Omega approached the rightful owner of Hergé they declined it. Omega replaced the rocket with a normal small seconds hand and another Speedmaster Pro Racing was born. The red and white squares already unveal that it has little to do with the previous racing watches, as the pattern was quite different (and had a different size). The unofficial Tintin watch has become quite popular in the meanwhile, since Speedmaster enthusiasts are aware of this little background story. It might do something for the future value of this watch, that’s for sure. In the original article, we used a scan of the Tintin books which showed the original rocket. We took them away after receiving letters from the Hergé publisher’s legal department. One of the highlights of 2013 with regards to Speedy Tuesday to us was to meet you guys at our Speedy Tuesday Event. Fratellowatches organized this event together with OMEGA and European Space Agency’s official visitor centre ‘Space Expo’ in Noordwijk, The Netherlands. A meet & greet with James H. Ragan (former NASA employee responsible for the procurement procedure and test procedures of the Omega Speedmaster in 1964) and with the fine people from the Omega Museum in Bienne. Omega brought some of their precious museum timepieces as well as the new collection (Dark Side of the Moon and Speedmaster ’57 models) to show to the guests that day. Also, Speedmaster fans had the opportunity to meet each other as well and exchanged information regarding their favorite timepiece. We hope to be able to organize more Speedy Tuesday Events in the future.Click here for the Speedy Tuesday Event Photo Report. 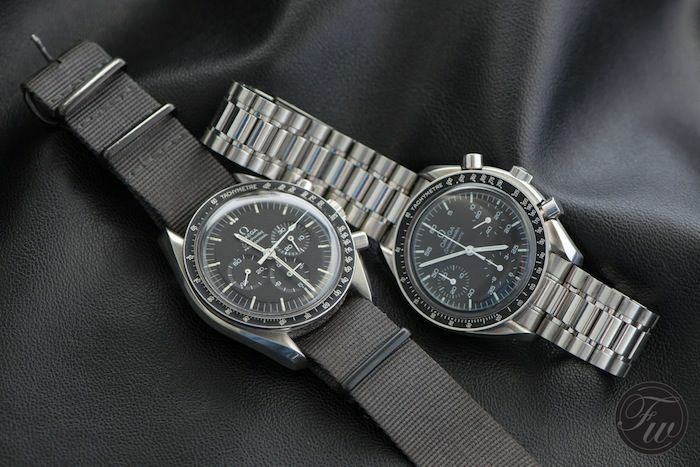 Although the Reduced has been replaced with the Speedmaster Automatic at some point, we still receive(d) emails on this topic since the Speedmaster Reduced has so many similarities with the Moonwatch. At first sight that is, as the Moonwatch has a hand-wound movement instead of automatic winding and also is a tad bit larger. There are more differences when you zoom-in on these two timepieces. Reason for us to hold them next to each other and show you the differences in detail. Click here for the Speedy Pro versus Speedy Reduced article. One of our Speedy Tuesday readers, Daniel Justin, contributed some of the photos he took of his Omega Speedmaster Professional Snoopy. 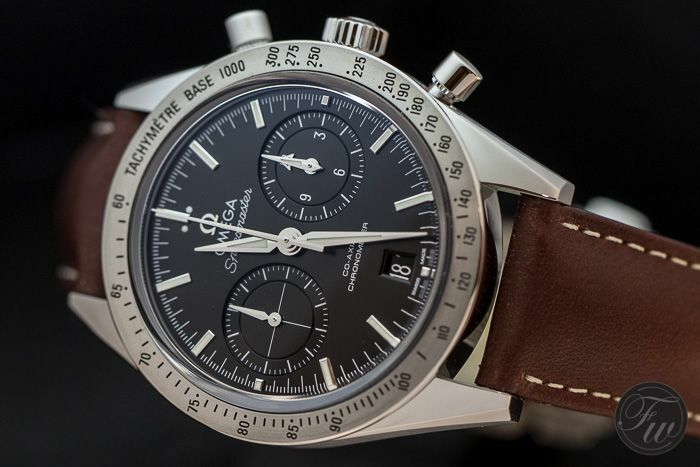 One of the most sought-after modern limited edition Speedmaster Professional watches. Introduced in 2004 in quite a high number of watches (5441 pieces) but sold out long time ago. 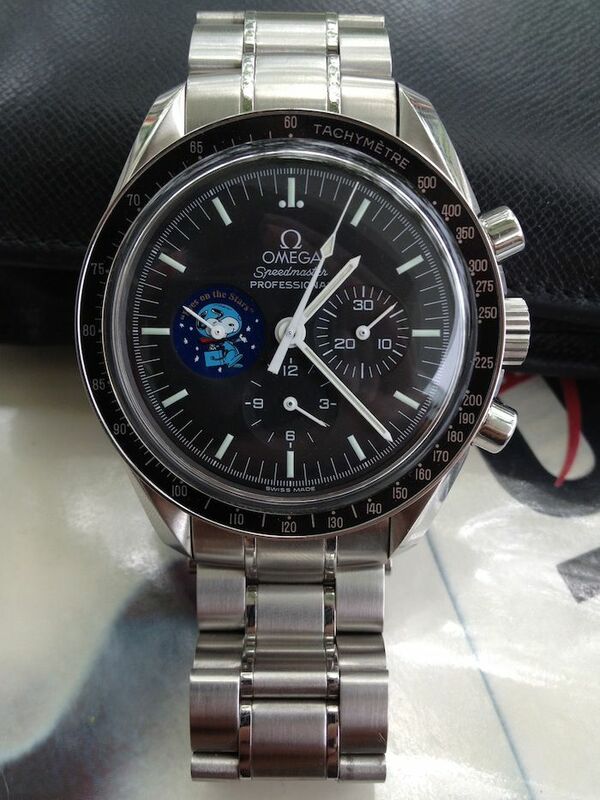 Ever since, the Speedmaster Pro Snoopy has increased in value quite a bit and are quite difficult to come by. We’ve been told by NASA’s James H. Ragan that family of NASA astronauts or NASA people themselves are on the look-out for these Snoopy watches. Especially when they are also in the possession of the Snoopy Award (a small pin if I recall correctly). Click the link if you want to have more background on the Snoopy Award, the link with the 1970 Apollo 13 mission that failed and why the Speedmaster played such an important role that it received NASA’s Snoopy Award. 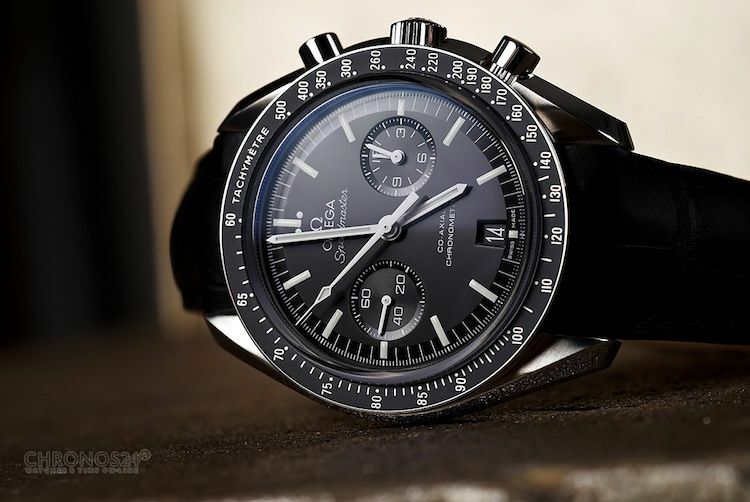 Also known as the Omega Speedmaster Professional ref. 3575-20. this Moonphase edition is based on the Speedmaster ’57 Replica (or re-edition) as introduced in 1997. With its Broad Arrow hands, a nod to the very first Speedmaster CK2915 as introduced in 1957. This edition has a cream white dial and blue hour markers and hands. And a moon phases complication of course. Powered by Omega caliber 1866, which is basically a caliber 1861 with a moon phases module added, this hand-wound caliber also has been used in almost all other Speedmaster Professional models with a moon phase. The very first Speedmaster Professional Moonphase was introduced in 1985 had had the predecessor of this movement, the caliber 866. On the 21st of July 2013, 44 years after the first astronaut set foot on the Moon, we had a little Speedmaster GTG (get-together) with some Speedmaster fans in The Netherlands. 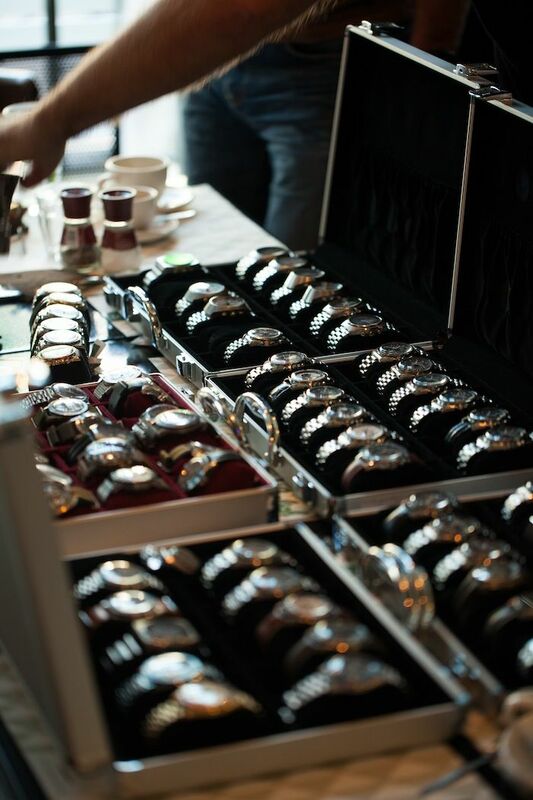 There were approx 60 Speedmaster watches on the table during the lunch from the collectors who attended the GTG. A little small event we will surely try to do again this year. The fourth and final mentioning of the new Caliber 9300 Speedmasters in this Top 10 of best read Speedmaster articles in 2013. We actually expected to see more interest in vintage Speedmaster watches but also can imagine that the demand for news on the recently introduced Speedmaster with this incredible cool movement is quite high as well. However, we have to say that it has been a close call with articles on vintage Speedmasters. The full gold and bi-color Speedmaster models might not be everyone’s taste, but we happen to like them ourselves as well. 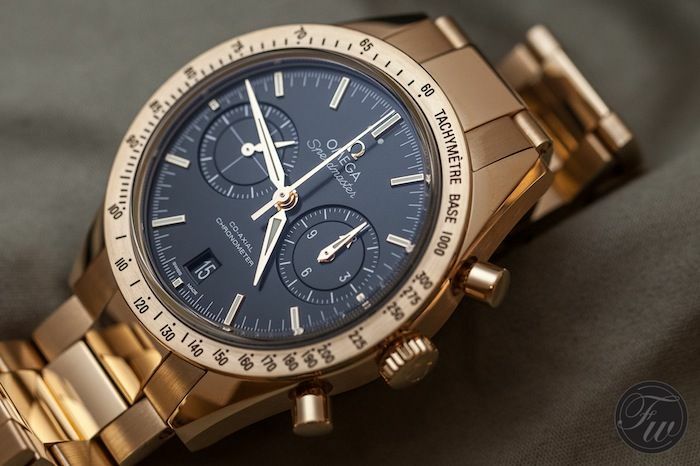 The full gold Speedmaster ’57 is certainly impressive and we’d pick it any time over a gold Rolex Daytona. Any time.